I once made a Mother’s Day bargain with God. Well, we didn’t exactly shake on it, but my heart was in the right place, and I was thinking about that whole ask and you shall receive thing, so at the time I thought it was a deal. My daughter was three years old, and my marriage to her father had ended. I was still in that angry stage—where almost everything was his fault. We promised to be amicable for our child’s sake, agreeing to share custody but to have her live with me. The dissolution of our marriage was surprisingly civil because we both adored our child. But in my head I believed that I was the only one who could help her navigate the tortuous path of childhood. I pleaded, God, just please let me live until she’s an adult! Pretty pleased that God was keeping the bargain, I looked forward with joy to my daughter’s senior year in high school. The year began with all the excitement of senior year and college visits and planning for her future. But just before Homecoming, at the beginning of October, I realized that the lump that I had long felt in my breast—the one that had never shown as anything on my yearly mammograms—wasn’t just another of those lumps I felt all the time. I had once said to my doctor that I did self-exams but that my breasts always felt lumpy to me. She told me she understood but that I should keep doing them because one day I might feel a difference. But not until it had time to grow much larger than the others. I went to the doctor, and she ordered a mammogram and a sonogram. 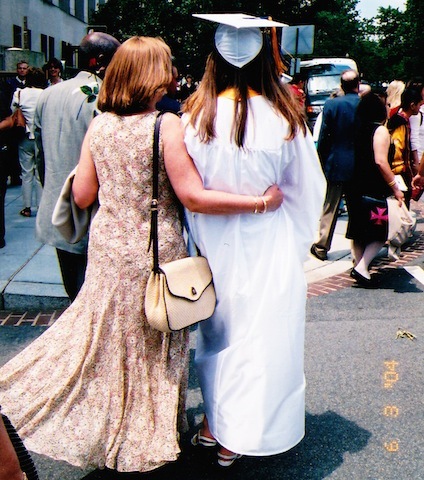 The sonogram showed that it was cancer, and by the end of October of my daughter’s senior year, we knew it was early Stage 3, and I began a course of therapy that would end two weeks before my daughter graduated. I was terrified. Yes, the cancer was scary. But even more scary was the thought that God was calling in the chips on the mom’s bargain I had made when she was three. I didn’t tell anyone my fears for a couple of weeks. As my daughter and my husband kept assuring me that I was going to be fine, I had a sinking feeling that I was done for. I thanked God for keeping the bargain and asked for the strength to get through what lay ahead. Finally, on the night before the surgery, just before I fell asleep, I turned to my husband and told him why I was so terrified. He listened quietly while I sobbed and told him about my deal with God. Now for those of you who don’t remember that story from your literature classes, Stephen Vincent Benet tells of a farmer who, after a string of bad luck, sells his soul to the devil. When the devil calls in the deal, the farmer is defended by a fictional version of one of America’s most famous lawyers, Daniel Webster, who bases his defense on the fact that the farmer is an American while the devil is a foreign prince. The devil points to numerous examples of his presence and citizenship on American soil, and so Webster argues for all the beautiful things, ending with “the new day that’s every day when you’re a child.” The jury sides with him, and Webster twists the devil’s arm behind his back and makes him promise to leave the farmer alone. He also asks the devil to tell him his own future, and the devil tells him all the disappointments he’ll face. Webster just wants to know whether our country, in spite of all its flaws, will prevail, and the devil grudgingly admits that it will. Webster laughs and kicks the devil out of the farmer’s house. On that night as I prepared for the loss of so much, I prayed a very different prayer than I usually prayed after my husband reminded me that life isn’t fiction. I thanked the Spirit for a presence with me in the muck and asked for courage for myself and my loved ones who would take this journey with me. It’s been nearly ten years since the night I offered that prayer—a Mother’s Day I didn’t expect back then to see—and over twenty years since I thought I was making a bargain with God. On this Mother’s Day, I offer a prayer of thanks—for the chance to see my daughter grow up to be not only a fine young woman but a wonderful friend. And unlike that Mother’s Day so long ago when I thought I was certain about the nature of God, I’m thankful, too, for the opportunities to learn that I’ll never have a Mother’s Day when life is a crystal vision of clarity. Tomorrow after church my daughter, her boyfriend, and my husband will make brunch for me, and we’ll spend some time savoring what it means to be a family. And I’ll thank God for whatever bargain landed her in my arms almost 27 years ago. It’s a bargain I can’t even begin to understand but one that fills me with awe and joy. So tell me of your grand bargains. Previous PostWhat Can I Do to Help?Next PostWhat Defines You, Me, Jolie?